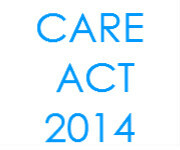 THE CARE ACT 2014, is something we should all get familiar with and it covers everything you need to know, the hows, the wherefores and the what to do’s. There is an ‘Easy Read’ Version and the more in depth version. Here are the links to take you straight there. CLICK TO TAKE YOU STRAIGHT TO THE EASY READ GUIDE. CLICK TO TAKE YOU TO THE IN DEPTH VERSION. It can and is a whole new world if you suddenly find yourself in a situation of having to find care and not knowing where to begin. Personally, I think my first port of call would be the GP. Of course this can vary for each of us, dependent on the situation .However, when you take the first step you soon realize how much help and support is out there. 3.Promoting integration of care and support with health services etc. 23.Exception for provision of housing etc. 59.Child’s needs assessment: requirements etc. 61.Child’s carer’s assessment: requirements etc. 64.Young carer’s assessment: requirements etc. 67.Involvement in assessments, plans etc. 69.Recovery of charges, interest etc. 76.Prisoners and persons in approved premises etc. 77.Registers of sight-impaired adults, disabled adults, etc. 97.Planning education and training for health care workers etc. 99.Quality improvement in education and training, etc. 111.Co-ordinating and promoting regulatory practice etc.